For whom do I fight? Must I fight my King? And thus it all began ... "It was a curious field of battle for the opening of the Revolution: 20 miles of winding hilly road connecting a port city and several country towns" (quote from U.S. National Park Service brochure titled "Minute Man National Historical Park, Massachusetts."). Battle of Lexington. 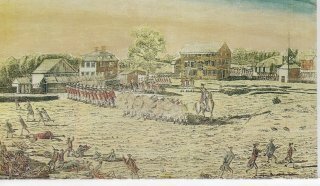 19 April 1775 British Red Coats fired on local ("rebel") militia in Lexington, Massachusetts in the first overtly hostile act. Later, at the Battle of Concord, the "rebels" sent the Red Coats into full retreat, and fired at them from behind every tree and boulder! Herein lies the tale as seen, told, and experienced from South Carolina. Many hesitating Georgians and Carolinians made up their minds after the Battle of Lexington and blood was spilled. As long as there was a chance for peace, it was a large step to begin a rebellion, but the choice was made for them by the British. When the news arrived that fighting had actually begun in Massachusetts, a number of men broke into the powder magazine in Savannah and took six hundred barrels of powder. North Carolina, April 1775. In April, 1775, the people of North Carolina drove the royal governor out of the colony, and in May the citizens of Charlotte, Mecklenburg County, North Carolina, declared the British government suspended. Part of the British plan for 1776 included the invasion of North Carolina under General Clinton and Sir Peter Parker. There were many Scottish highland royalists (aye, and more is the shame for those of us with Scottish blood!) in the colony, who hastened to raise a force to cooperate with the British. Why on Earth they did this, with all the Scottish hatred of the British, I simply do not understand. About 1600 of these loyalists under Donald MacDonald marched down the Cape Fear River, and on 27 February 1776 at Moore's Creek Bridge, fiercely attacked 1000 patriot riflemen under Colonels Caswell and Lillington. Despite the odds, patriots won a brilliant and overwhelming victory, capturing several hundred of the loyalists. Just deserts. Sir Peter Parker decided the locals were not particularly friendly, could give a golly gee whiz about his "Sir," and he kept right on going to South Carolina! We meet him again in the defense of Charleston June 1776. South Carolina: The Provincial Congress committed the country to war, and adjourned to re-assemble on the 20th of June 1775. But the battle of Lexington intervened, removing any hope of a final reconciliation with the mother country. The Provincial Congress instead met on the first of June 1775. From Simms' 1844 Book, The Life of Francis Marion, is quoted a contemporary letter from Isaac Marion, a brother of the Swamp Fox, who dwelt at Little River, the Northern boundary of South Carolina. It was written to accompany the express, which brought the news of the battle of Lexington. The following is the letter of Isaac Marion, addressed to the Committee of Safety of Little River. Boundary, May 9, 1775, Little River. Your obliged humble servant, &c.
The members of this body passed the following act of association, with considerable opposition (emphasis by FOC): "The actual commencement of hostilities against this Continent by the British troops, in the bloody scene of the 19th of April last, near Boston -- the increase of arbitrary imposition from a wicked and despotic ministry -- and the dread of insurrections in the Colonies -- are causes sufficient to drive an oppressed people to the use of arms. We, therefore, the subscribers, inhabitants of South Carolina, holding ourselves bound by that most sacred of all obligations, the duty of good citizens to an injured country, and thoroughly convinced, that, under our present distressed circumstances, we shall be justified before God and man, in resisting force by force -- do unite ourselves, under every tie of religion and honor, and associate as a band in her defence, against every foe -- hereby solemnly engaging, that, whenever our Continental and Provincial Councils shall deem it necessary, we will go forth, and be ready to sacrifice our lives and fortunes to secure her freedom and safety. This obligation to continue in force, until a reconciliation shall take place between Great Britain and America, upon Constitutional principles -- an event which we most ardently desire. And, we will hold all those persons inimical to the liberty of the Colonies, who shall refuse to subscribe to this association." Second Provincial Congress. In July, 1775, a second Provincial Congress was called. Fall of the Royalist Government in Georgia, August 1775. Believing that they at last they had the support of the majority of the people, the leaders in Georgia proceeded to take control from the royalists. In August 1775, the royalist officers of militia were dismissed, the port of Savannah was closed to British ships, and in December all the courts were taken over by a Council of Safety. This Council was a body of fifteen leading republicans, created by a public meeting held at Savannah in June 1775. To complete the destruction of the royalist government, in January 1776, (British) Governor Wright was arrested by (Patriot) Major Joseph Habersham. He was confined to his house under guard, but in a few weeks escaped to one of the king's vessels in the harbor. Charleston: First British Invasion of the South, 1776. South Carolina, ever the firebrand state, acting under the lead of Henry Laurens, seized the royal arsenal and munitions of war long before the news of Lexington and Concord had reached that colony. Some months later, the royal governor withdrew from the colony and John Rutledge was vested by the Colonial Assembly with the power of Governor. Under Rutledge 5000 Carolina militia were enlisted for the defense of that colony. Charleston, its leading seaport, was then one of the most prosperous American cities. In June 1776, British commanders Clinton and Parker prepared to reduce it to submission. In the meantime, however, Colonel William Moultrie, with a kind of careless skill, had constructed fortifications of palmetto logs at the southern end of Sullivan's Island, at the entrance to the harbor of Charleston. Palmetto, for those of you no longer are familiar with our fair state, is a funny looking tree that thrives near the coast with a fuzzy trunk that I always thought of as looking like some kind of palm tree. Here was placed a defending force of about 1200 men, while several hundred men and a battery (cannon) were sent to defend the northern end of the island against a possible landing party. Defense of Charleston, 28 June 1776. The British attacked on the morning of 28 June 1776, and bombarded Fort Sullivan (the palmetto log construct described above) from a fleet of war vessels, aided by a landing force of several thousand men under Sir Henry Clinton. The landing party was promptly repulsed by the guns of the battery at the north end of the island. The British fleet, however, began a heavy ten hour bombardment. The Americans returned fire causing great damage, while the shots of the British bounced off or sank almost harmlessly into the soft spongy, but strong enough!, palmetto logs. As at Bunker Hill, the patriots had a meager powder supply, but used it to good advantage, firing with the cool precision of trained soldiers, and did terrible damage to the British ships. The flagship of Admiral Parker was made a wreck, he himself was wounded, and only one of the other nine vessels was immediately able to put to sea after the battle. No more disastrous defeat of a British armament is reported in history (take that Admiral Reuyter!). During the hottest part of the bombardment, the flagstaff on Fort Sullivan was cut down and the flag fell outside the walls of the fort. Sergeant William Jasper (after whom Jasper County was later named) leaped down, secured the flag, attached it to a sponge staff, and replaced it on the ramparts. He was later offered a lieutenant's commission in recognition of his inspiring act, but he modestly refused it. Lord William Campbell, the expelled royal governor of South Carolina, while on the flagship of Sir Peter Parker, was mortally wounded. The South Carolina Historical Society has an excellent description of the Battle of Sullivan's Island (off this web site, use your back arrow to return). And another South Carolina Historical Society web site devoted to the Battle of Sullivan's Island (off this web site, use your back arrow to return). In addition to the damage to their ships, the British lost 200 men in the conflict, while the American loss was but 12 killed and 25 wounded. The British ship Aciwon ran aground on the site of present day Fort Sumter and was burned by the the victorious Americans, not, however, before its guns were first redirected at the other British ships. Just as the engagement at Bunker Hill and the evacuation of Boston freed New England from British armies, so the successful defense of Fort Moultrie (so named after the battle, this is the same palmetto log construct) for a period of three years saved South Carolina and the other southern colonies from invasion. This first decisive patriot victory preceded the Declaration of Independence but a few days, and, becoming known at about the same time, began things on a strong footing. It unfortunately was not to remain so. Simms' (1844) Description of The Battle of Fort Sullivan in the Defense of Charleston: With the formation of new regiments, under the resolves of the Council of Safety, Francis Marion, newly promoted to a Major, was ordered with his Regiment, under command of Col. Wm. Moultrie, to take post at Fort Sullivan, on the island of that name, which stands at the entrance of Charleston harbor, and within point blank shot of the channel. Fort Sullivan, better known as Fort Moultrie, was yet to be built, it was only an outline upon the sand. Palmetto rafts lay around it, waiting to be moulded into form. The structure was a simple wall, behind which young beginners might train guns to do mischief to a veteran enemy in front, the vaunted British Navy. Its form was square, with a bastion at each angle, sufficiently large, when finished, to cover a thousand men. It was built of logs, laid one upon another in parallel rows, at a distance of sixteen feet, bound together at frequent intervals with timber, dovetailed and bolted into the logs. The spaces between were filled up with sand. The merlons were walled entirely by palmetto logs, notched into one another at the angles, well bolted together and strengthened with pieces of massy timber. Such was the plan of the work; but, with all the diligence of the officers, and all the industry of the men, it remained unfinished at the perilous moment when a powerful British fleet appeared before its walls. The defence was confided to Col. Moultrie. The force under his command was four hundred and thirty-five men, rank and file, comprising four hundred and thirteen of the Second Regiment of Infantry, and twenty-two of the Fourth Regiment of Artillery. The whole number of cannon mounted on the fortress was thirty-one, of these, nine were French twenty-sixes; six English eighteens; nine twelve and seven nine pounders. The unfinished condition of the fort, really presented little more than a front towards the sea, literally a facade. On the 20th of June, 1776, a day ever memorable in the annals of South Carolina, the nine British ships of war commanded by Sir Peter Parker, drew up abreast of the fort, dropped anchor, with springs upon their cables, and commenced a terrible bombardment. The fire of the enemy was promptly answered, and with such efficiency of aim as to be long remembered by the survivors. Having but five thousand pounds of powder, with which to maintain a conflict that raged for eleven hours, with unabated violence, it became necessary, not only that the discharge from the fort should be timed, but that every shot should find its target. In order to do this the guns were trained by the field-officers in person; hence, perhaps, the terrible fatality of their fire. The Bristol, a 50 gun ship, commanded by Commodore Sir Peter Parker, lost 44 men killed and thirty wounded. Sir Peter himself lost an arm. The Experiment, another 50 gun ship, had 57 killed and 30 wounded. To these two vessels in particular, the attention of the fort was directed. The words, passed along the line by officers and men, were -- "Look to the Commodore -- look to the fifty gun ships." The smaller vessels suffered comparatively little. Their loss of men was small. The injury to the vessels themselves was greater, and one of them, the Acteon, ran aground, and was subsequently burnt, but not before it's guns were directed at the enemy. The Carolinians lost but twelve men killed and twice that number wounded. One of the former was the brave Macdonald. When borne from the embrasure where he received his mortal wound, he cried out to those around him -- "Do not give up -- you are fighting for liberty and country." The want of powder was severely felt. But for this, judging from the effects of the fire from the fort, the British Commodore himself would have been killed, or his fleet would have been destroyed. So slow, at one time, were the discharges -- so great the interval of time between them, -- that the British were of opinion that the place was abandoned. But a new supply of powder was obtained by Marion, who, with a small party, leaving the fort, proceeded to the armed schooner Defence, lying in Stop Gap Creek, and seized upon her powder, by which the fire was kept up until a supply of five hundred weight was received from the city. This new powder supply caused a renewal of the conflict in all its fury. The garrison fought with a coolness which would have done honor to veterans. The day was very warm, and the men partially stripped in response. Moultrie states that when the action begun, some of the men took off their coats and threw them upon the top of the merlons. He saw a shot take one of them and throw it into a small tree behind the platform. It was noticed by our men, and they cried out, "look at the coat!" A little incident that speaks volumes for their coolness. Moultrie himself and several of his officers smoked their pipes during the action, only removing them when it became necessary to issue orders. In the hottest fire of the battle the flag of the fort was shot away, and fell without the fort. Jasper, one of Marion's men, instantly sprang after it upon the beach, between the ramparts and the enemy, and binding it to a sponge staff, restored it to its place, and succeeded in regaining his own safety. The coolness, the cavalier indifference, displayed by the Carolinians throughout the combat, is not its least remarkable feature. There is something chivalric in such deportment, which speaks for larger courage than belongs to ordinary valor. Mere bull-dog resolution and endurance is here lifted, by a generous ardor of soul, into something higher than a mere passive virtue. The elasticity of spirit which it shows might be trained to any performance within the compass of human endowment. Declaration of Independence Signed. And I bet you thought this started it all! The Provincial Congress met again in January, 1776 to chose delegates to the Continental Congress to sign the Declaration of Independence on 4 July 1776. The signers of the Declaration of Independence almost all suffered enormously before this war was over. Summary. After the Battle of Lexington the hesitation of the majority of Georgians and Carolinians about entering the revolutionary movement ended. The patriots organized, held meetings and Provincial Congresses, and in the summer of 1775 overthrew the royalist government at Savannah, by arresting the governor and expelling the royalist officers from the militia. They then sent delegates to the Continental Congress, at Philadelphia, and the delegates there signed the Declaration of Independence. North and South Carolina likewise successfully threw out the British. Campaigns in South Georgia 1778-1783. In the early days of the war, the military activity of Georgia was directed against Florida. Florida had been ceded to Great Britain in 1763. St. Augustine was strongly fortified and again threatened the safety of Georgia and South Carolina. The southern border of Georgia was constantly raided by bands of British, Indians and royalists. Three separate expeditions were organized against St. Augustine, and all ended in failure.